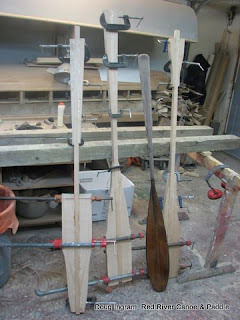 Just when I had my first batch of paddles under control I had some new ones to start. One of these is for my other daughter, one for a niece, and one for a friend of my elder daughter and niece. So, four of the paddles that I am working on now are for young women who will be attending Manitoba Pioneer Camp next summer. My niece and the friend will be taking their "LIT" Leader In Training course. 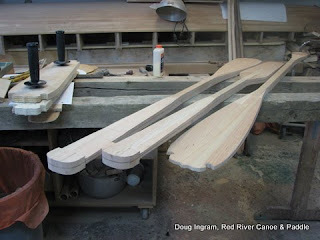 I am mighty impresses that they valued a good paddle enough to order one! 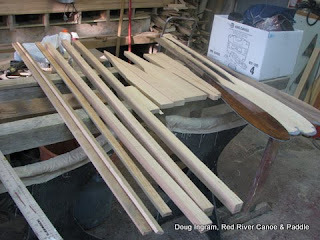 Here the paddles are cut to shape, the grips are roughed out, and the bulk of the wood on the tip is cut away ready for routing for the epoxy/fiberglass tip. Posted by Doug Ingram at 11:13 p.m.